Are you having difficulty securing an auto loan through banks or other lending firms due to bad credit? By now, you may be considering other financing options. A great place to start is a dealership that offers used car in-house financing in Greenville. It can provide loans for customers with low credit scores who want to purchase vehicles. Get an auto loan with us in Greenville. If you have a low credit score and you need a car, you may apply for used car in-house financing in Greenville. Some dealerships may not even run a credit check. Proof of residency, down payment, and a steady source of income are some requirements you might need when you apply for used car in-house financing in Greenville. Loans through banks or other lending firms may entail multiple visits just to complete your transaction. Meanwhile, dealerships that offer used car in-house financing in Greenville will do most of the work. You can check their vehicle inventory and visit their showroom. One of their representatives will discuss the details of their used car in-house financing in Greenville. Once you agree with the terms, you sign the paperwork and drive home a vehicle. We offer a huge inventory of quality secondhand vehicles from known brands. You may purchase a car, truck, or SUV through our used car in-house financing in Greenville. Our dealership provides used car in-house financing in Greenville through our own company, Key West Financial, to help you purchase used vehicles in great condition. We also offer competitive rates and various payment options for you. We perform a thorough 38-point inspection on every vehicle we offer. This examination includes checking crucial components such as the engine, brakes, transmission, battery, and computer system. This will ensure you will get a reliable vehicle purchased through our used car in-house financing in Greenville. 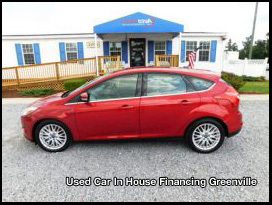 Our dealership also sells low-mileage units, which you may own through used car in-house financing in Greenville. Our dealership offers a standard 30-day or 1,000-mile warranty on any of our vehicles purchased with used car in-house financing in Greenville. Additionally, customers may choose either a 12- or a 24-month extended warranty through our Auto Store Care Protection Plan. Getting car loans, including used car in-house financing in Greenville, and making timely payments may improve your credit score. Turn to Auto Store for used car in-house financing in Greenville, and we will help you build your credit. We report to all three major credit bureaus: Equifax, Experian, and TransUnion. Rely on none other than Auto Store when it comes to used car in-house financing in Greenville. Applying for our used car in-house financing in Greenville is simple, and you can get pre-approved instantly! Are you planning to get a new vehicle? Browse our collection of various makes and models at Auto Store! Through hassle-free transactions, we help car buyers get the ride of their dreams. Contact us today. To learn more about our company, visit our website. We make it easy!